A month ago I mentioned this free download about Lent and had big dreams about 40 days of focusing with my family. 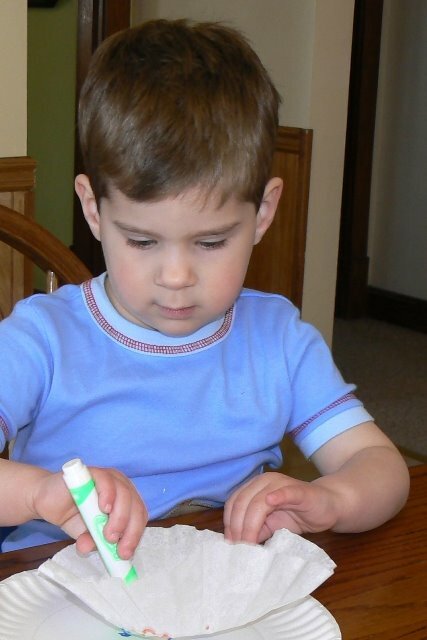 Well, a week ago I sat down, looked at the list for the first time and chose 26 items to help build anticipation for Easter, appreciation for what Jesus’ did for us on the cross and stress the miracle of the Resurrection. I figured we would start the morning after St. Patrick’s Day (when Shamrocks were out of their system from so many school crafts) and go from there. 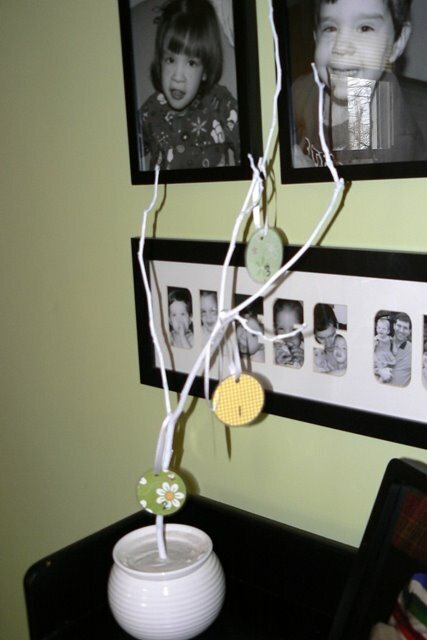 My kids are SUPER visual so it gave me an opportunity to be crafty. A lady came through my line at work and bought a white flower pot. 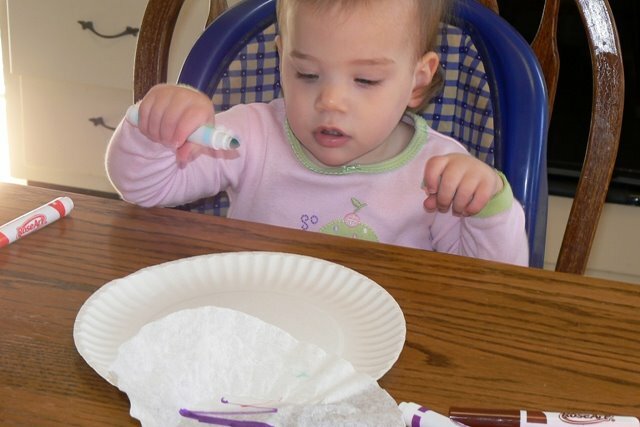 She told me that she was going to take a limb and paint it white and make “Easter Trees” for some families with children. 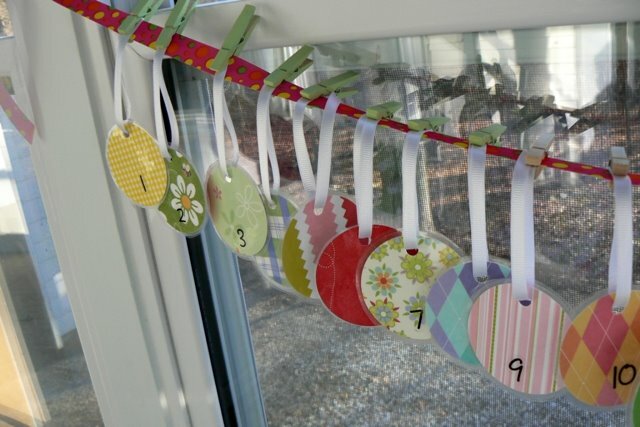 I had already made the countdown circles during lunch that day and was looking for a way to hang them. Ta DA! The answer came from this customer! The first day we learned the greeting “Christ is Risen” – – “He is Risen Indeed!” It is precious to hear my Bubba respond to me with “Risen Indeed!” LOVE IT! Second day we planted grass and talked about God’s creation and how He gives all things life. 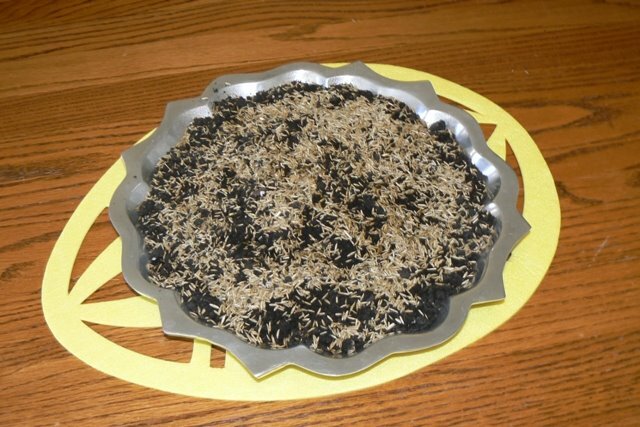 We put soil on the platter and the kids scattered the seeds and we have been spraying water on it daily. The first shoots appeared today! It’s on the sun porch now but plan for it to be part of our centerpiece on Easter. 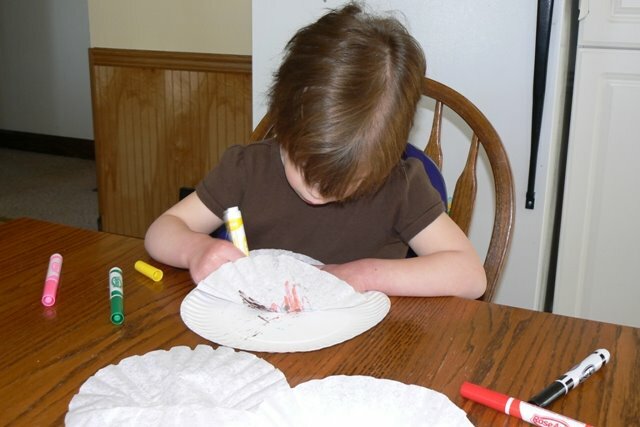 The third day was a butterfly craft using coffee filters, markers, and a spray bottle. It went surprising well considering my little brood’s needs. I don’t have a picture of the finished product but let’s just say you can’t tell mine from theirs’ and they ALL look adorable. Other activities have included reading a special Easter book (The Parable of the Lily), praying for missionaries who are telling others about what Jesus did for them and talking about how WE can tell others too, hanging an Easter banner (not actually done yet ’cause I messed up the letter I and then ran out of paper), and tomorrow is eating by candlelight because He is the Light of the World. Fun, eh? It really has been nice to have a plan. Simple daily activities have made it attainable so far. We’ll see how the rest of the weeks go. I’ll keep you “posted”. Get it? Posted! Blog post. . . I slay me. i love this. People do so much hoopdie doo about christmas but seem to forget that easter is about Christ as well, and if they do remember, they remember it for 1 day – and it’s all about jelly beans and egg hunts!WAY TO GO! Cute idea! 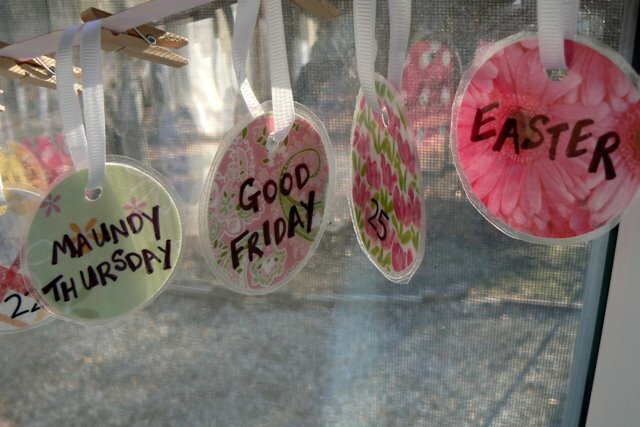 Noelle Piper had a similar in her book, “Treasuring God in the Traditions”, only instead of countdown circles she did Easter “ornaments” representing the resurrection…I’ve been debating on whether I could throw that together b/f Easter. We shall see. But yours is motivational and cute! Great ideas- you have once again motivated me to do something. Thanks for sharing your ideas. I love your circles and the tree idea. I downloaded the booklet, but it still sits on my desk awaiting doing something with it :(. I love what you have done so far! I am sure your kids are loving it, too. You are a great mom! What a sweet idea- looks lovely Becky. I am regretting that I didn’t get in earlier to do something like this.